facts | Girl. 30. Living this thing called life. What is this? I hear you cry! 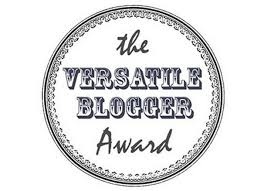 I’ve only gone and got a Versatile Blogger award..
With these Internet awards, come rules! 1. Put the award on your blog and SMILE! 2. Do tell your readers that you’ve received the award! 3. Thank the kind person who nominated you and post a link to their blog. 4. Now, you go ahead and nominate 15 other lovely bloggers who you think are deserving of the award. 6. And finally, list 7 fascinating facts about yourself. Please, go ahead and start click-click-clicking onto their blogs! And here are the 7 facts about me! 1. I like saying to my other half things like: “How old are you? 4?” And then finding myself HILARIOUS. 2. I am weird. (See above). 4. I am stupid. (See above). 5. I find weird things funny. Like saying the word “Vaseliiiiiine” In a very high pitched voice, stretching the i. Try it. I bet you liked it. 6. I talk to my dog. I know other people do it too, but here I am, brave enough to admit it. I imagine he calls me SUPER MUM. 7. I cannot read or play music, I cannot read or speak any foreign language, but I can spell supercalifragilisticexpialidocious. I would just like to say, yet again, a HUGE Thank you to the wonderful ZOOBOO who nominated me. Without you, I wouldn’t have received this award.